The Campine chicken breed originates in Belgium and is an excellent layer of medium size, white eggs. Size: Standard Male: 6 Ibs. / Standard Female: 4 Ibs. 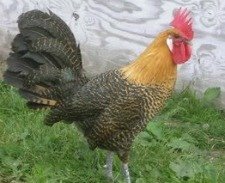 / Bantam Male: 26 oz. / Bantam Female: 22 oz. Comb, Wattles & Earlobes: They have bright red wattles that are medium in size and well rounded and bright white earlobes that are oval and fit closely to the head. They have a bright red medium size comb that has five deeply seperated points. Female: The first point stands upright and the other four droop to one side. 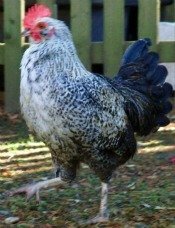 Color: The beak is horn, the eyes are dark brown, and the shanks and toes are leaden blue. The plumage is quite lustrous in both sexes. Golden: The head and hackle are golden bay and the remainder is golden bay with black barring. There are black bars on the tail that are about four times as wide as the golden bay sections. Silver: The head and hackle are white to silvery white and the remainder is white with black barring. There are black bars on the tail that are about four times as wide as the white sections. Special Qualities: They are an excellent layer of medium white eggs. This old Belgium breed is said to have origins that date back to the time of Julius Caesar. Historians believe that the bird descended from the Belgium breed called the Brakel, that dates back to 1416 where descriptions appeared in writings. This breed noticeably differs from the Brakel in many ways. For instance, it is smaller than the Brakel, and the male lacks side and saddle feathers that the Brakel has. Some historians attribute these to the poor soil conditions in the Campine area where the breed originated. The breed did go through a tough time after WWII where it almost died out. Breeders came to the rescue and built the breed back up. Although it is still a rare breed today, it is stable. The birds are chatty, but friendly and are good foragers and fliers. Because of their lustrous plumage, they are treated as ornamental birds in North America, but don't let that fool you. They are excellent layers of medium-size, white eggs-sometimes reportedly laying more than two-hundred eggs per year. The hens also rarely go broody. This breed was first recognized by the APA in 1914.